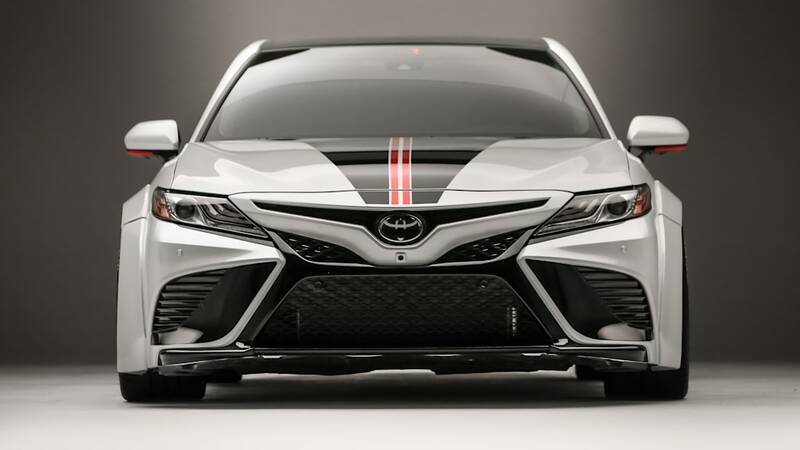 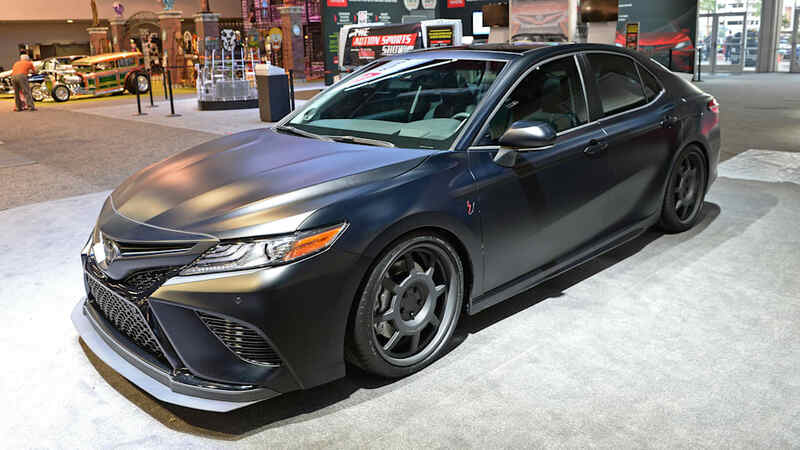 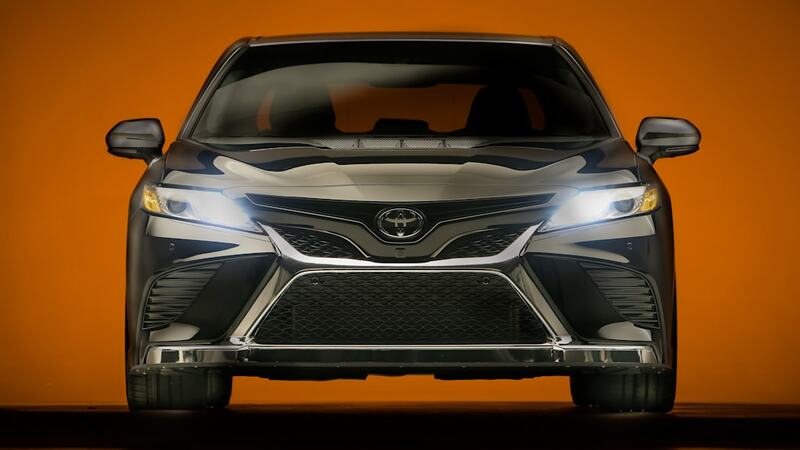 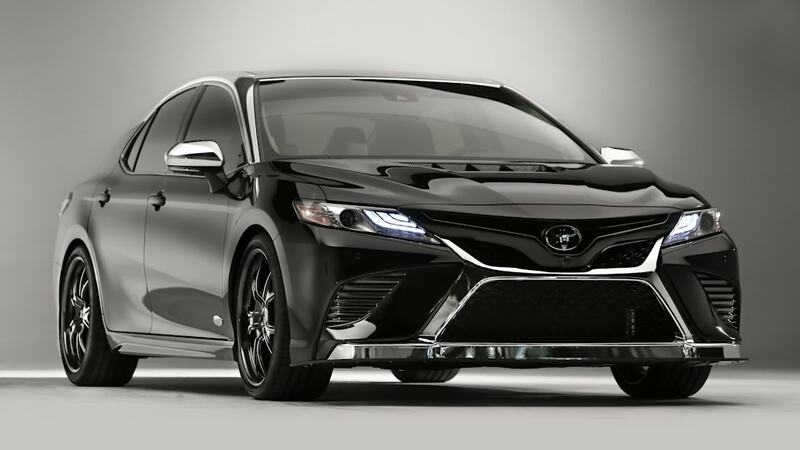 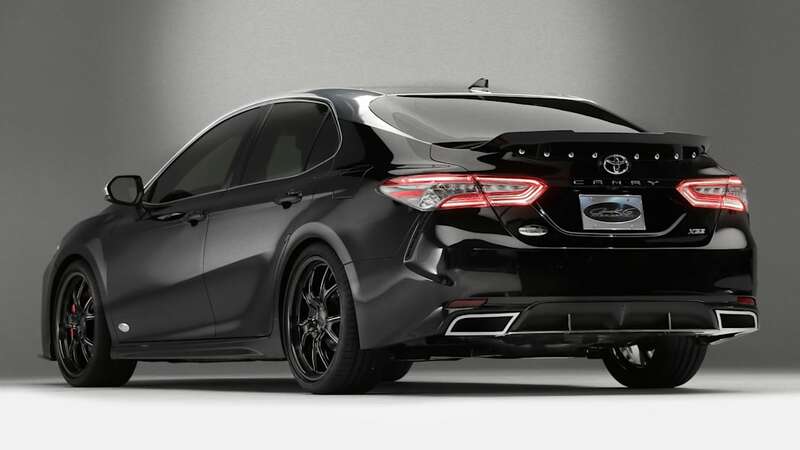 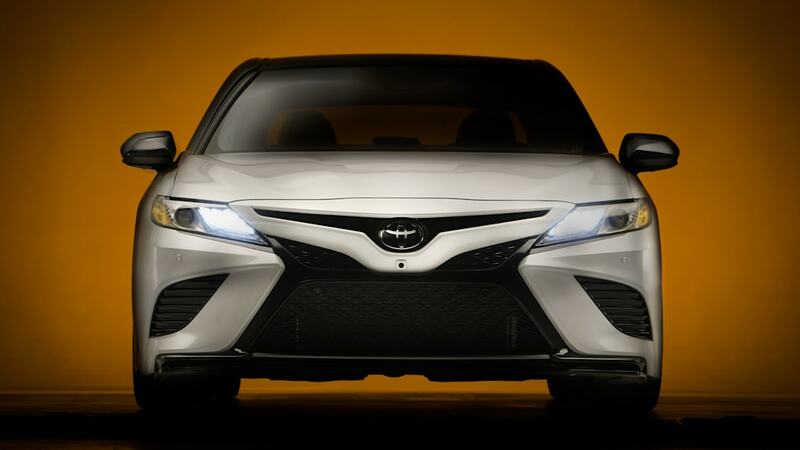 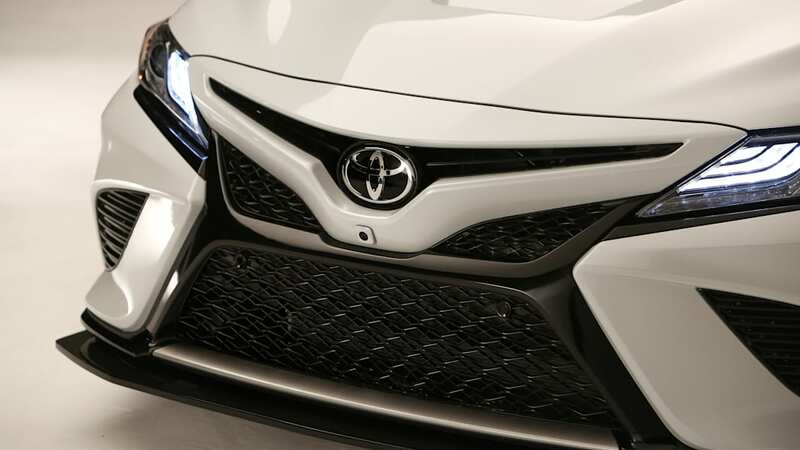 For this year's SEMA show, Toyota is showcasing a bunch of custom 2018 Camrys. 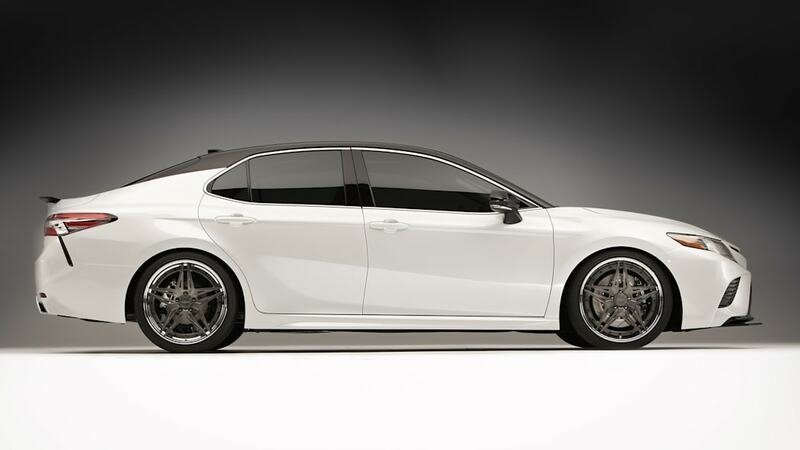 And despite being very different, they all share one common theme, besides being Camrys. 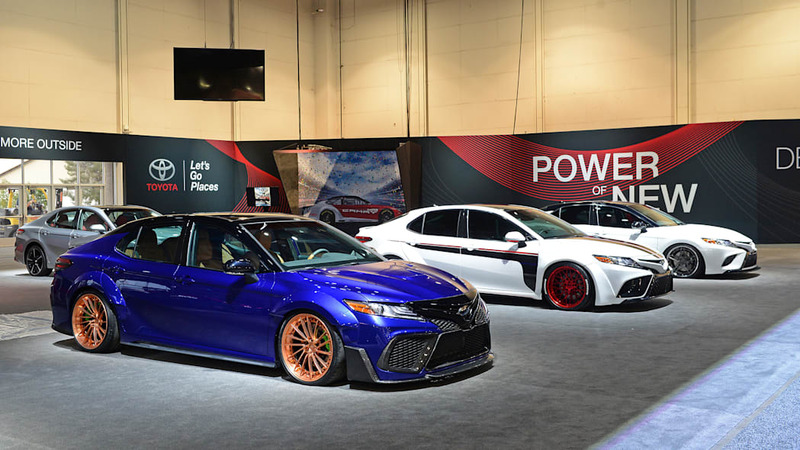 They're all customized by NASCAR drivers who race the Camry. 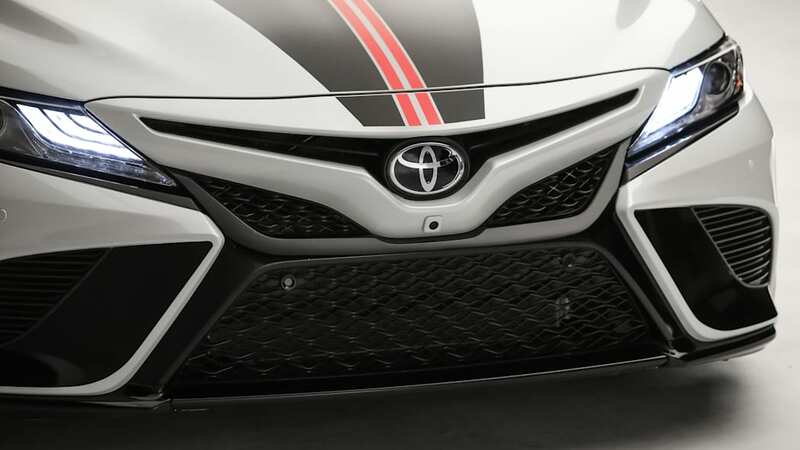 Well, all of them except the one from TV commentator and former "Top Gear USA" host Rutledge Wood. 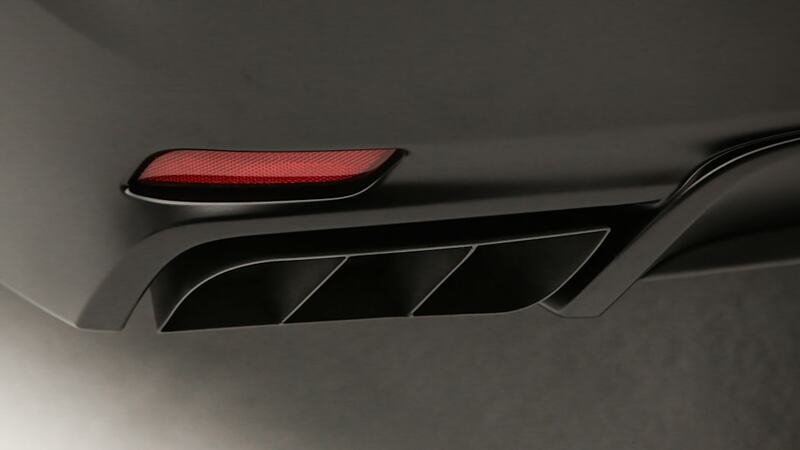 The cars range from subtle to outrageous. 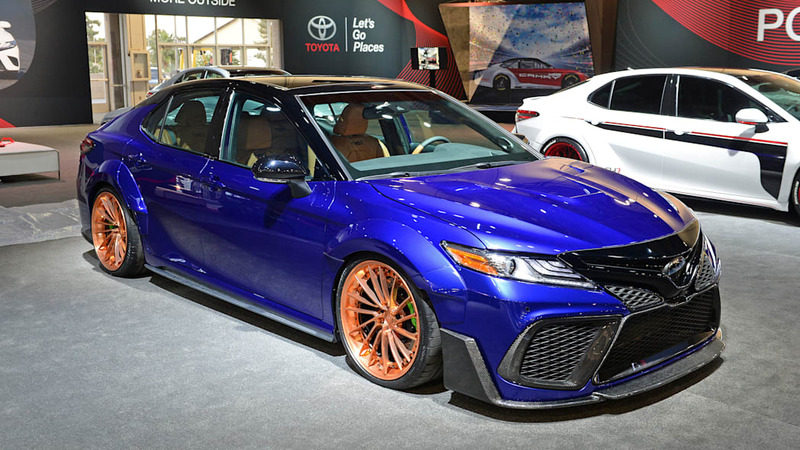 Easily the most outrageous is the purple and gold one from Mr. Wood. 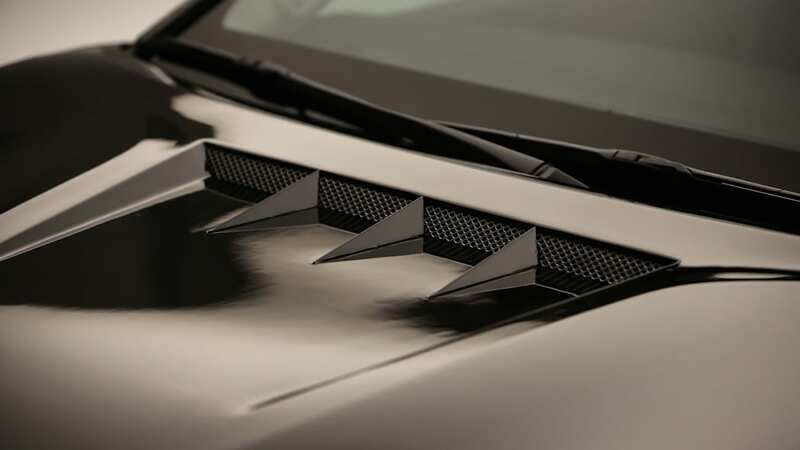 Pictured above, the car features aggressive body modifications, many of which were developed using 3D-printing technology. 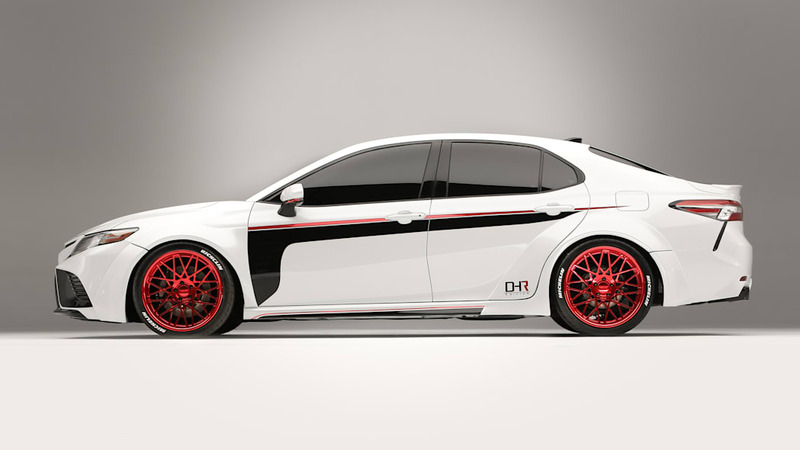 Those parts include the hood, bumpers, diffuser, side skirts, and headlight housings. 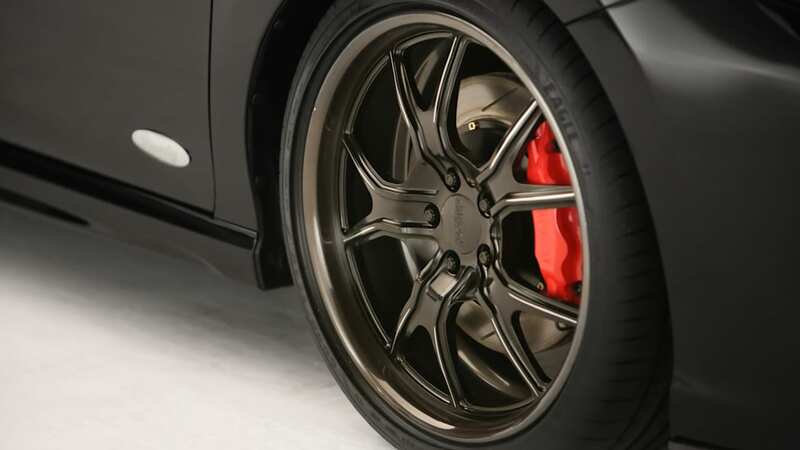 The gold wheels are from Rotiform Performance. 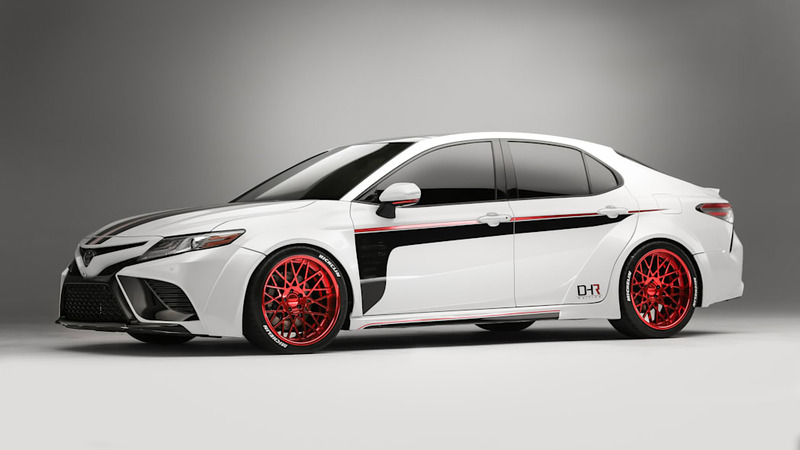 Modifications are minimal, consisting of a Megan Racing suspension and a MagnaFlow exhaust. 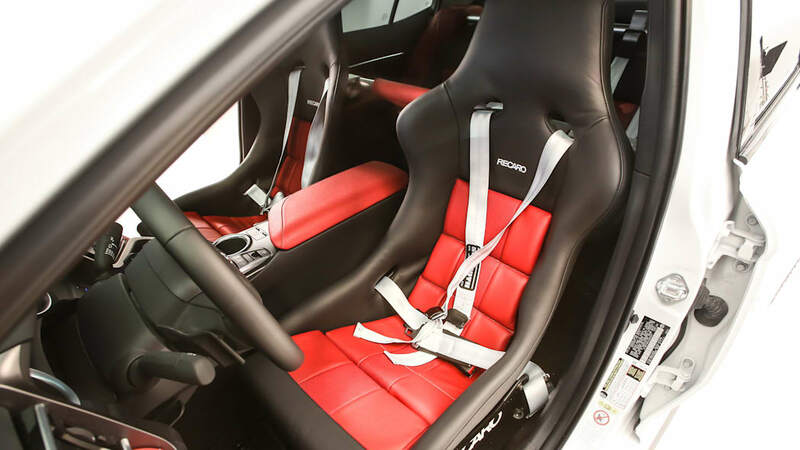 Inside, the seats and body panels are covered in tan leather. 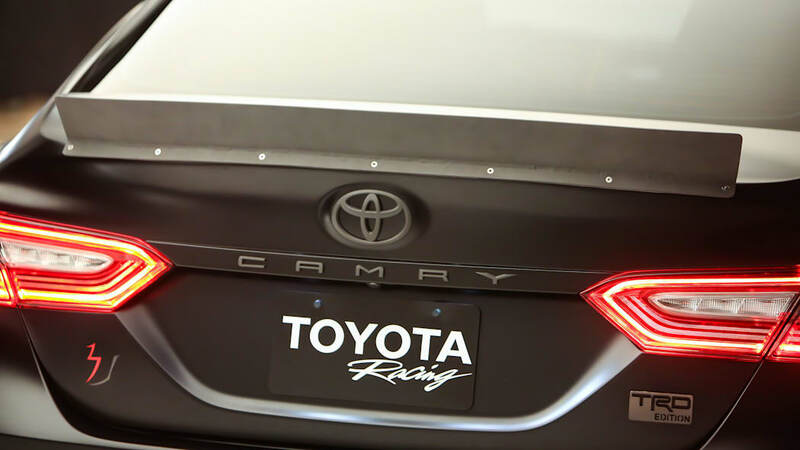 Not far behind Wood's Camry in extreme appearance is Denny Hamlin's car. 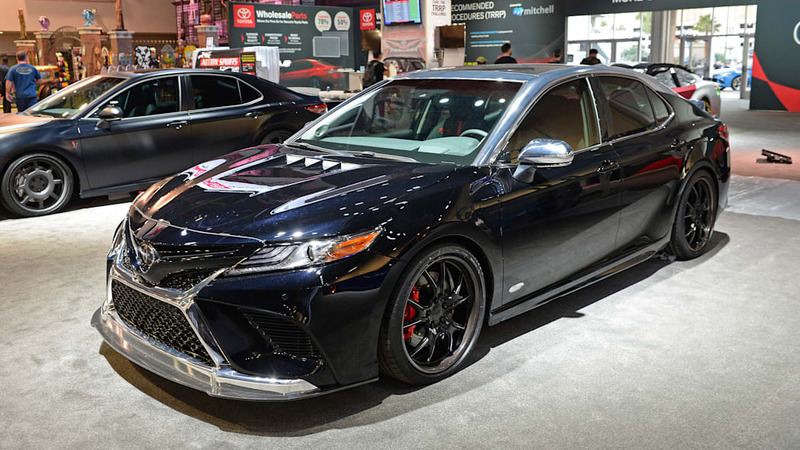 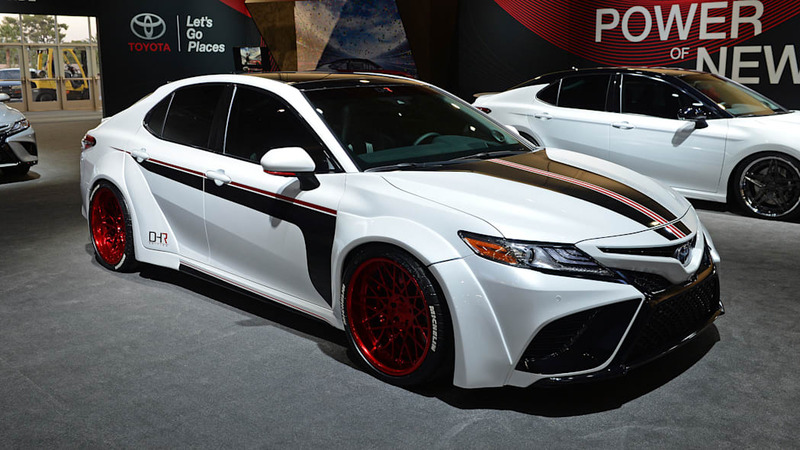 The paint job of Hamlin's Camry is a little less extreme using tried-and-true white, black and red hues, but it still has a big aggressive body kit. 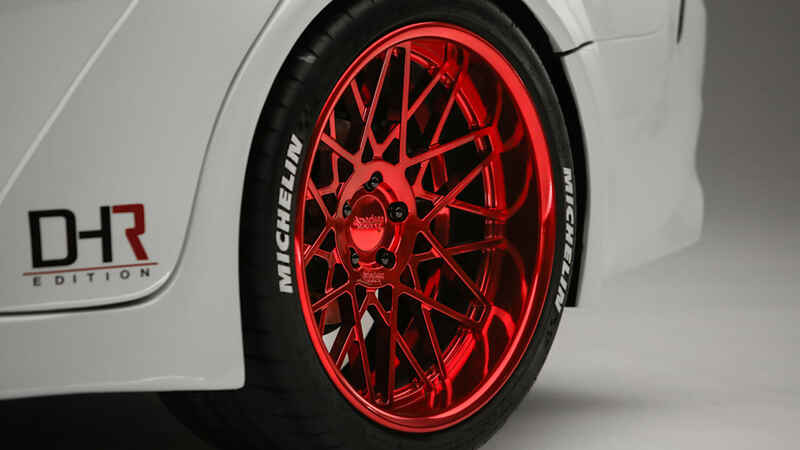 The kit is necessary, too, since the car wears custom 10-inch wide American Racing wheels with 275-mm tires. 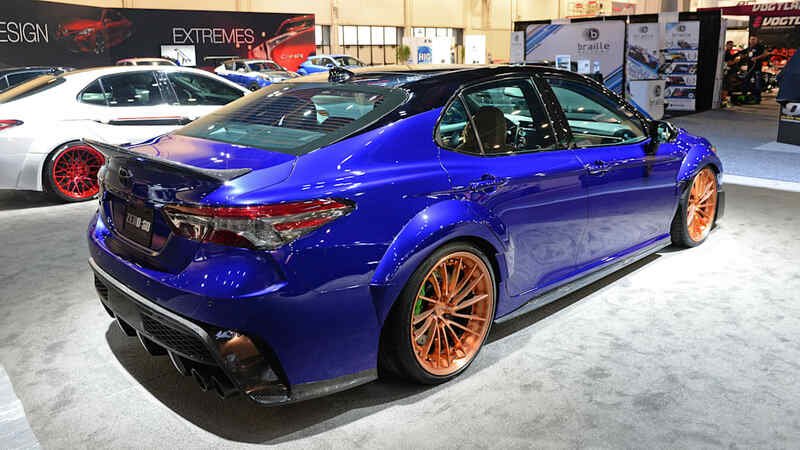 Performance is a bit more impressive than Wood's car. 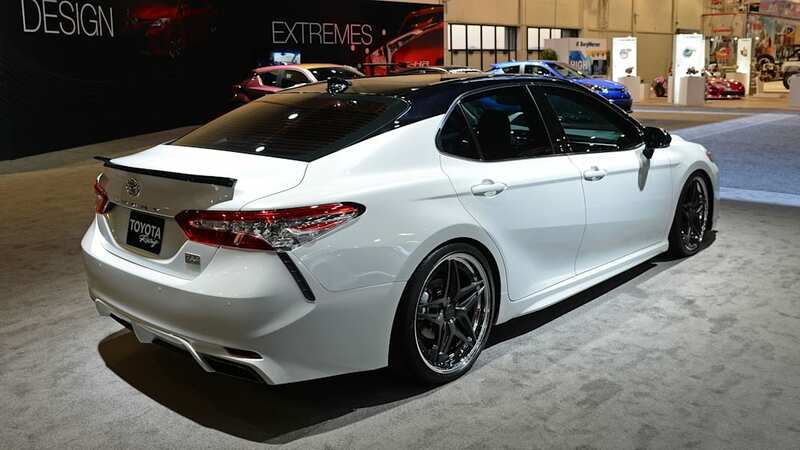 It features an intake and exhaust from AEM as well as a Tein coilover suspension and StopTech brakes. 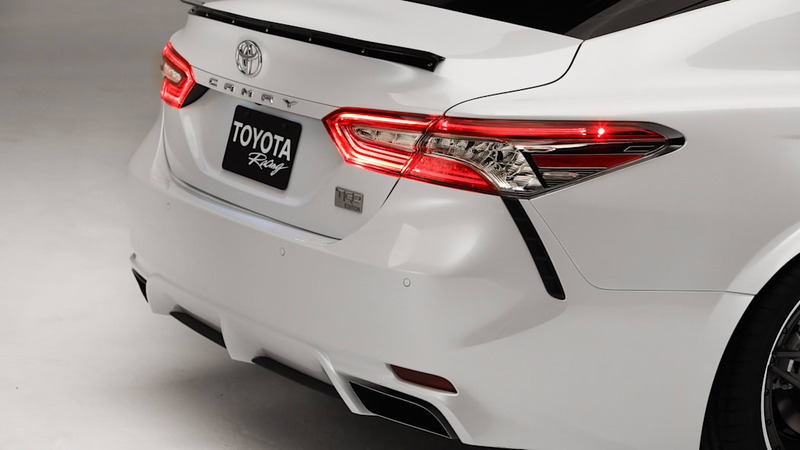 On the other end of the spectrum is Daniel Suarez's Camry. 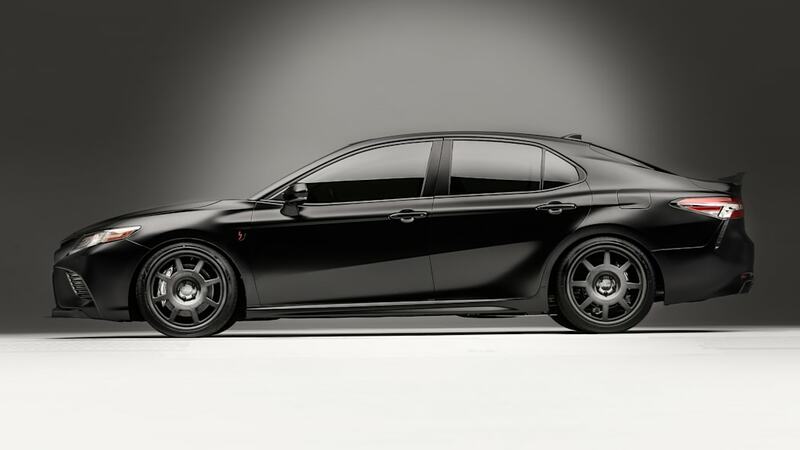 It's easily the most modest and subtle of the cars on display. 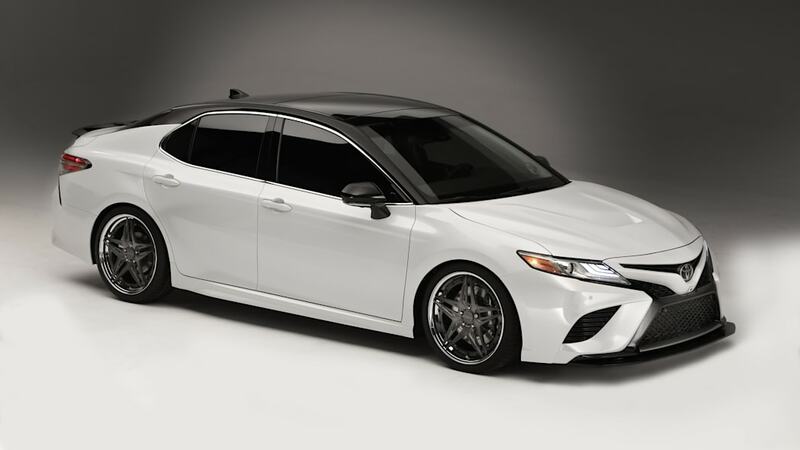 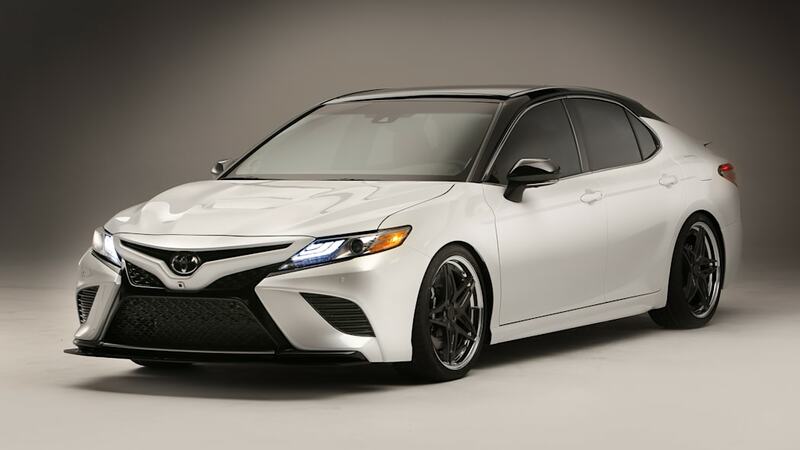 It's simply a pearl white Camry with a black roof. 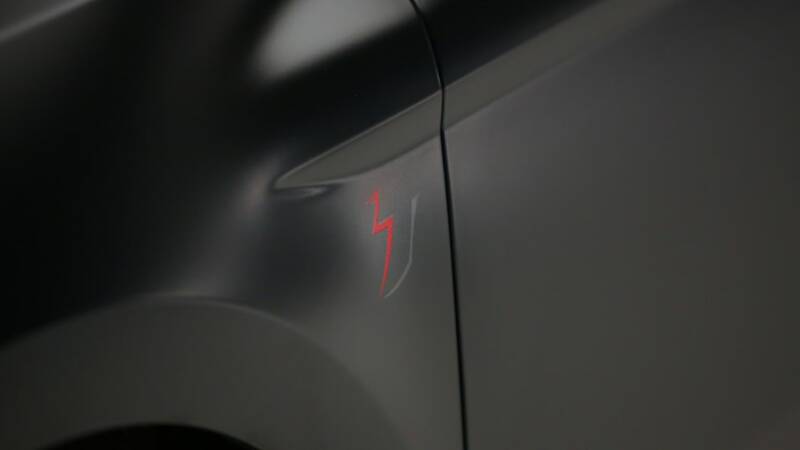 But there are clever details such as the light gray racing number. 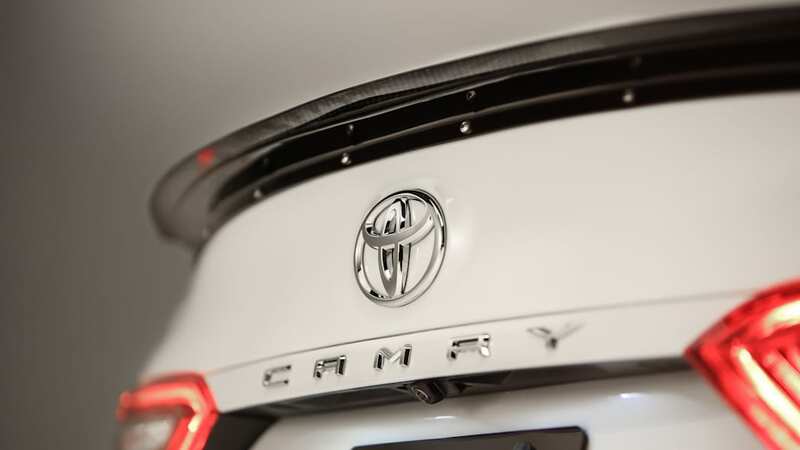 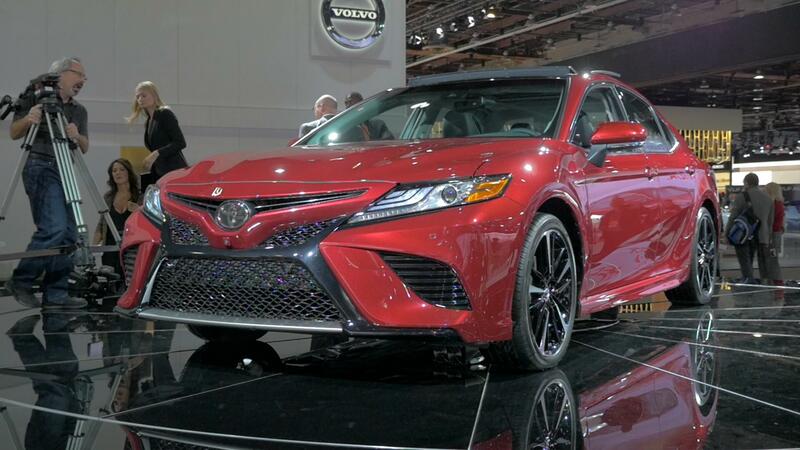 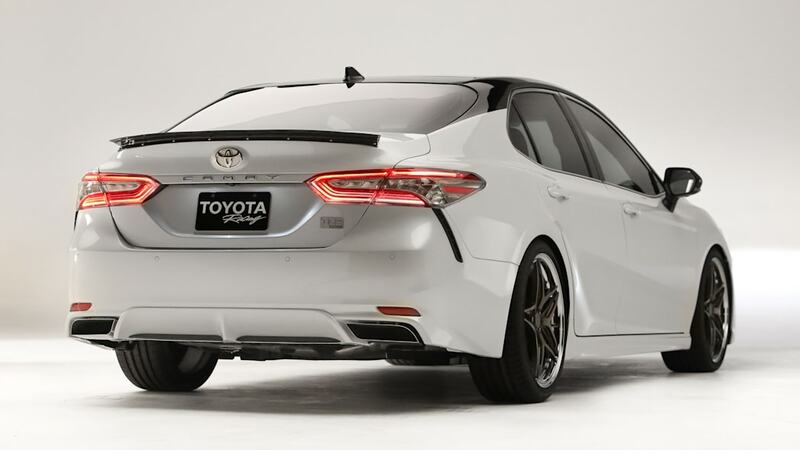 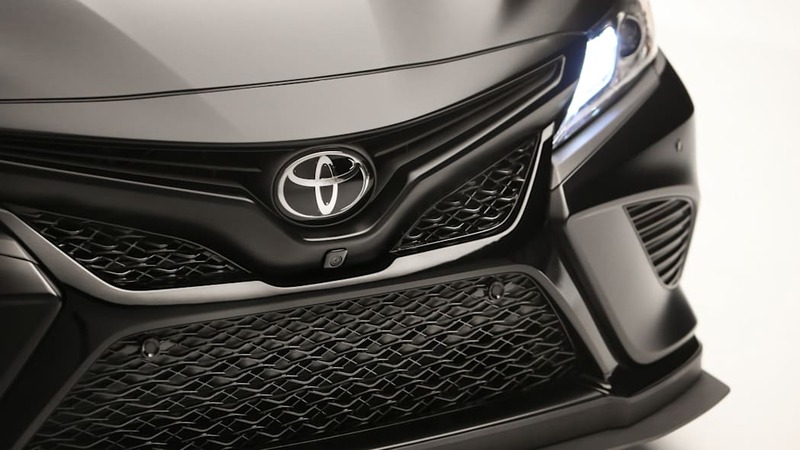 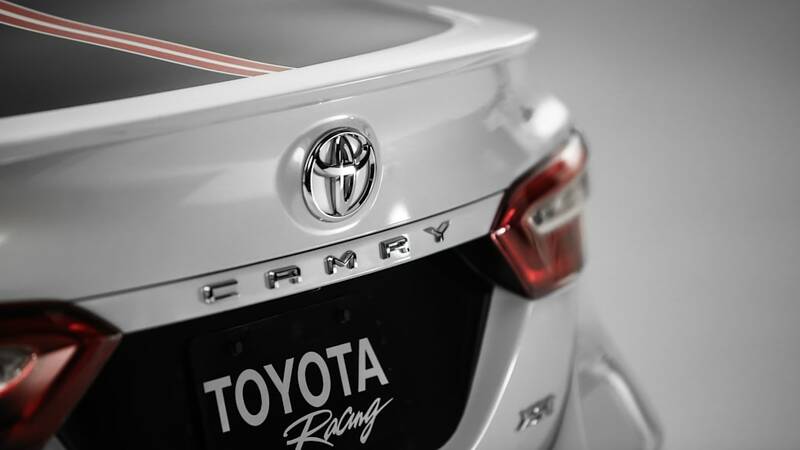 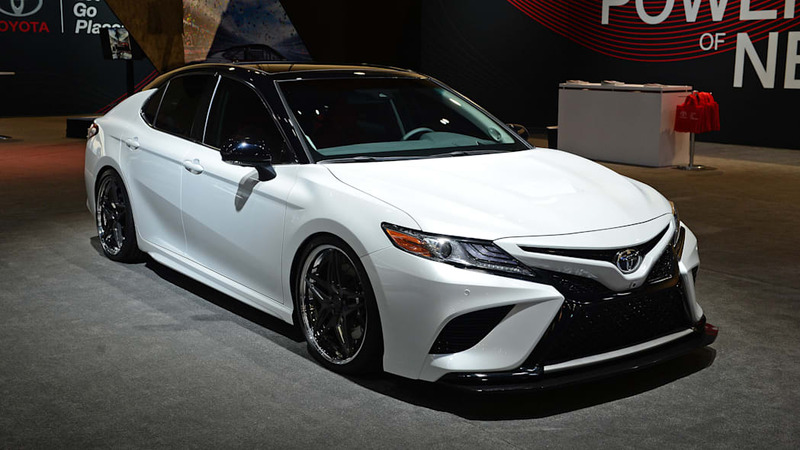 The body changes are minimal, with the exception of what Toyota claims are functional front and rear spoilers. 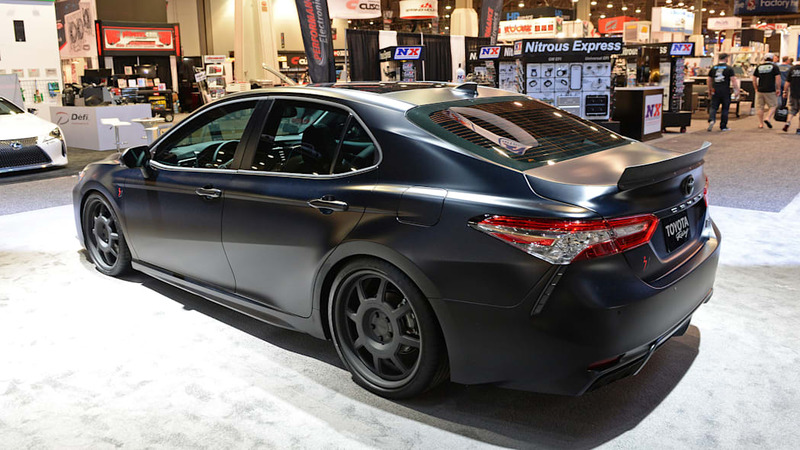 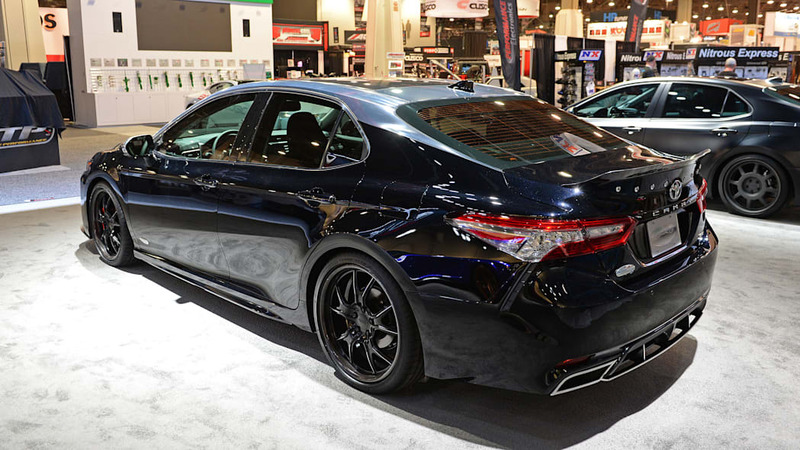 The performance upgrades are similar to Hamlin's car, featuring an AEM intake, Tein coilovers and StopTech brakes. 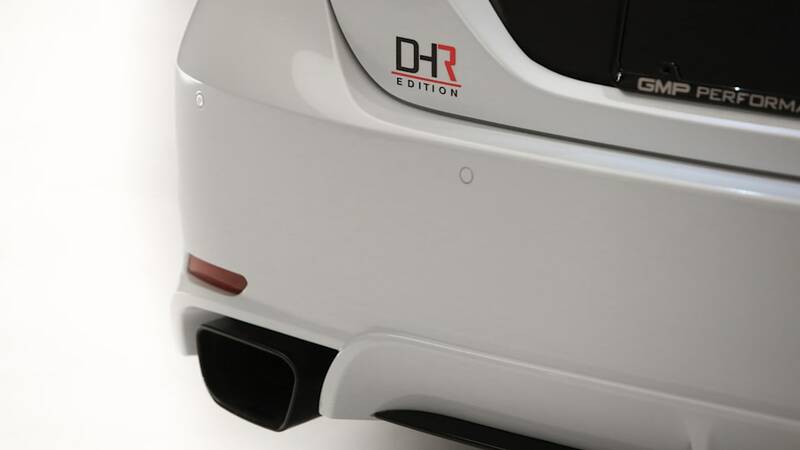 The exhaust is a custom TRD piece, though. 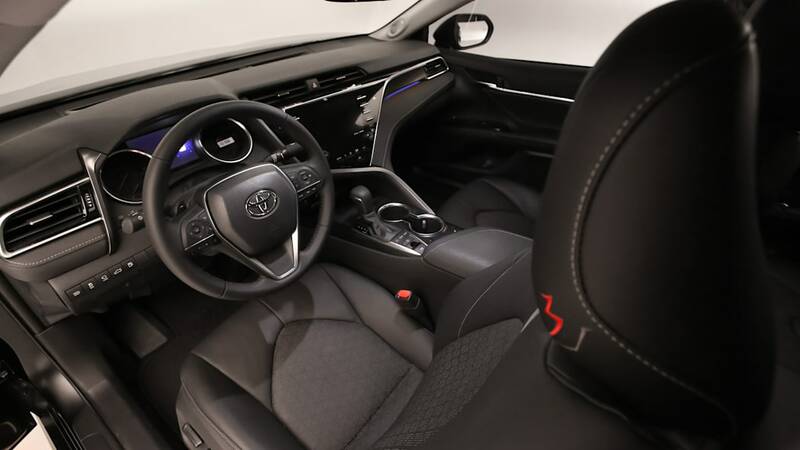 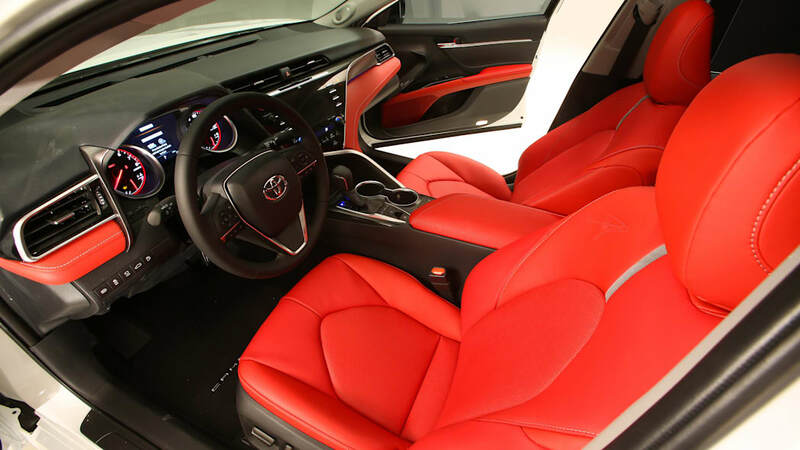 The interior is bolder than the exterior, with an eye-popping red upholstery and dashboard trim. 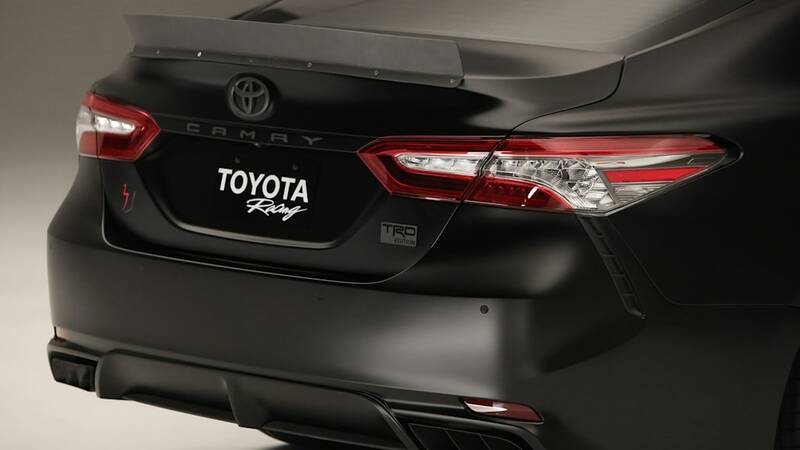 The Camry from Kyle Busch is the literal inverse of Suarez's. 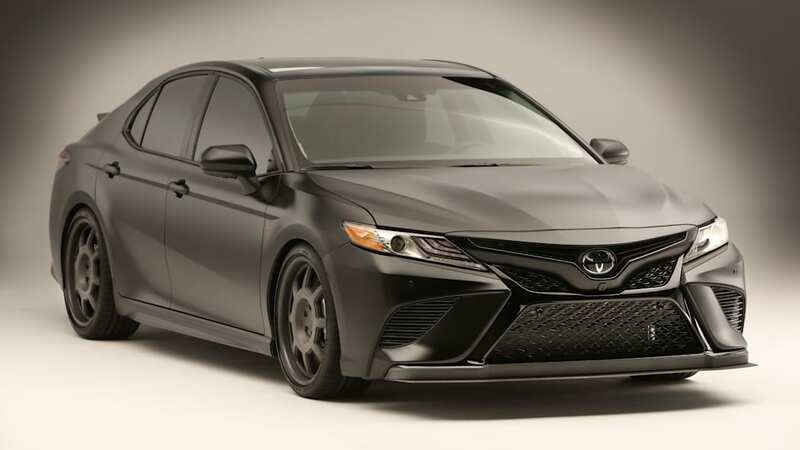 It has a black body with a polished metal-finish roof. 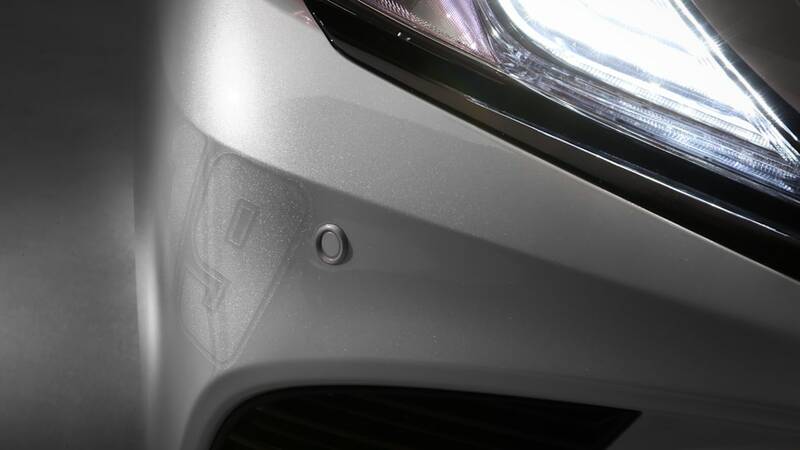 Other polished-metal finish trim is found throughout. 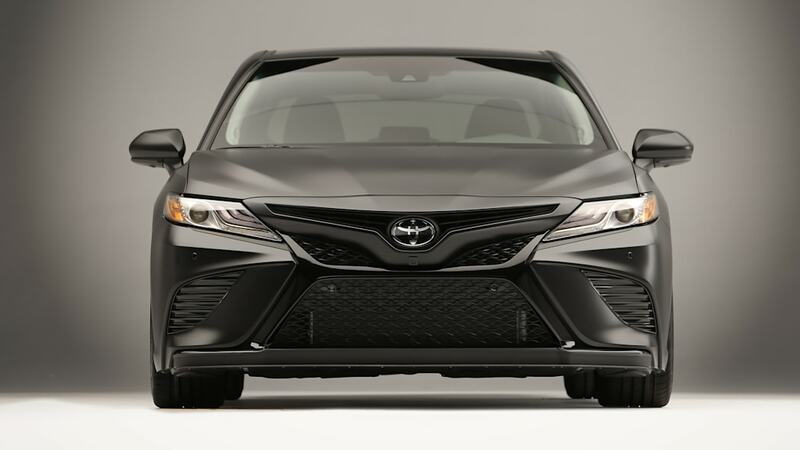 The most distinctive visual upgrades are the prominent hood scoop with metal strakes, and the NASCAR-style bolt-on rear lip spoiler. 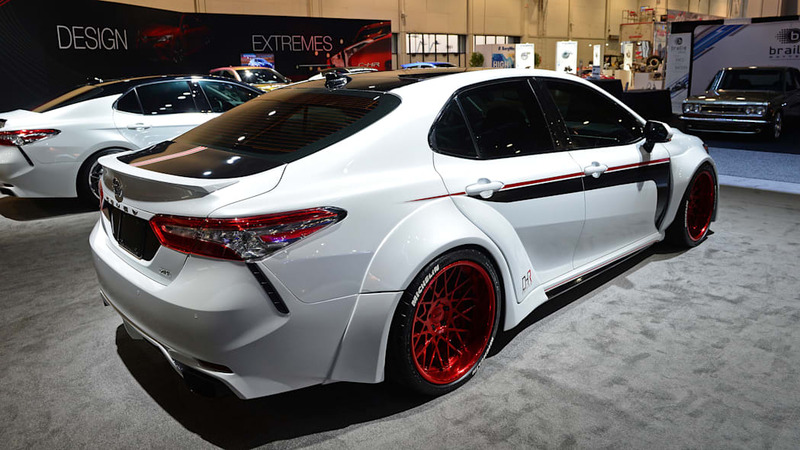 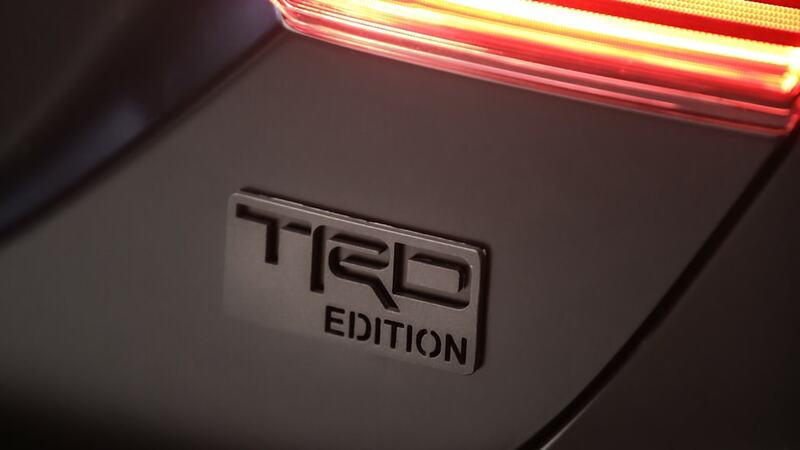 The only mechanical changes are an AEM intake, TRD exhaust tips, and StopTech brakes. 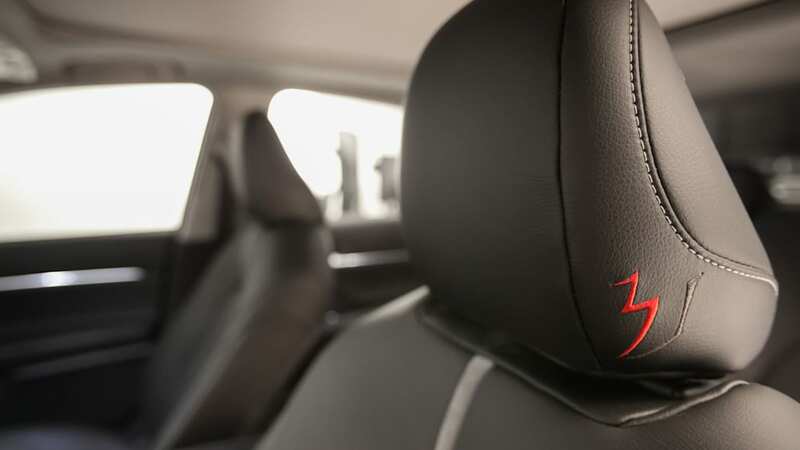 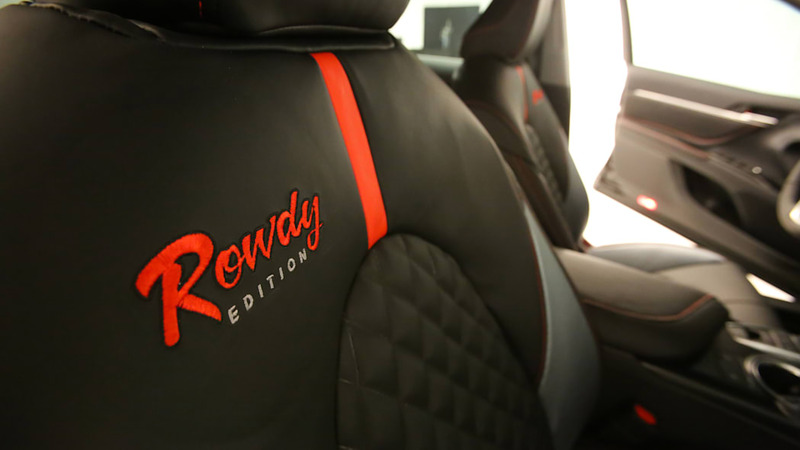 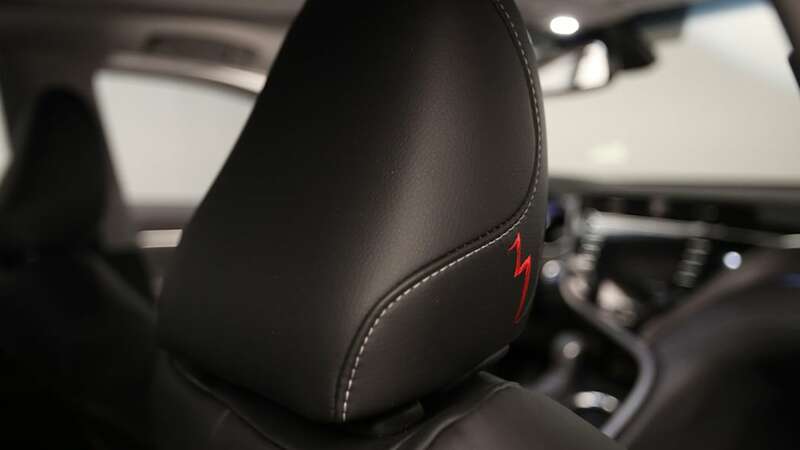 Inside, the seats feature black and silver leather, with diamond-quilted inserts. 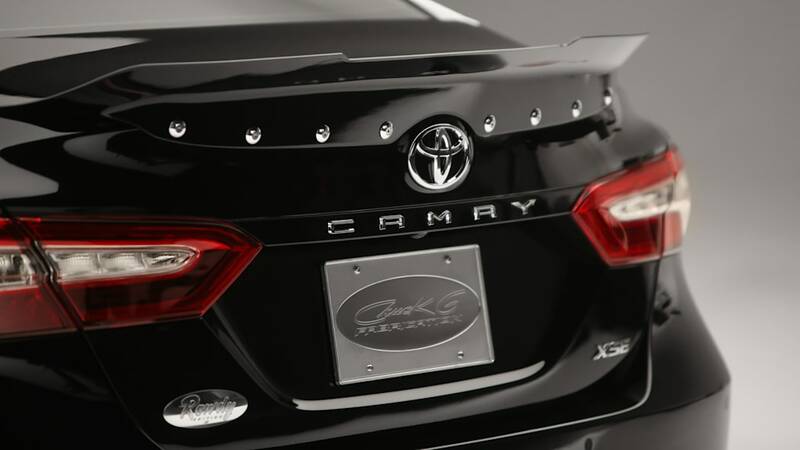 Rounding out the group of Camrys is one from Martin Truex Jr. 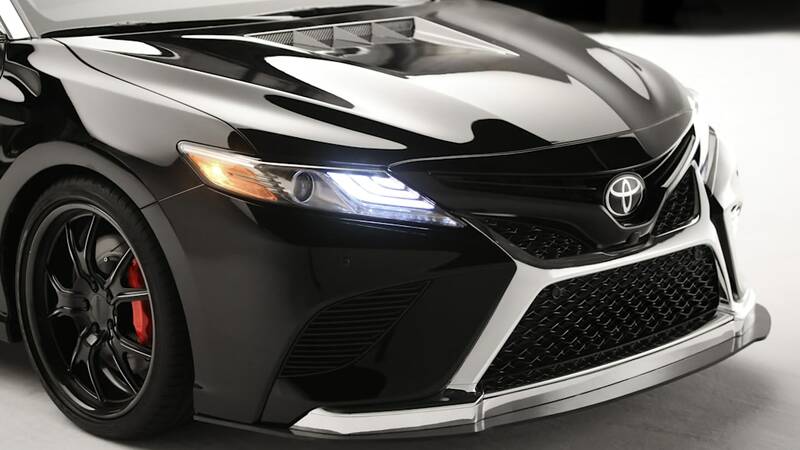 It's a menacing-looking machine in its satin black paint. 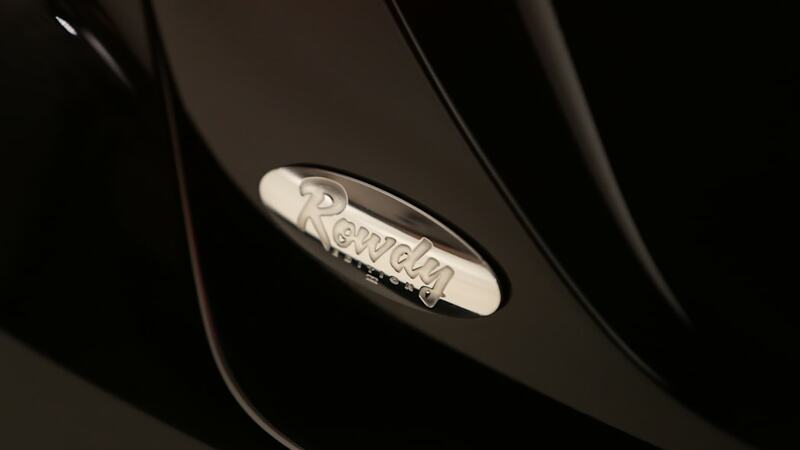 All of the chrome exterior trim has also been finished in black. 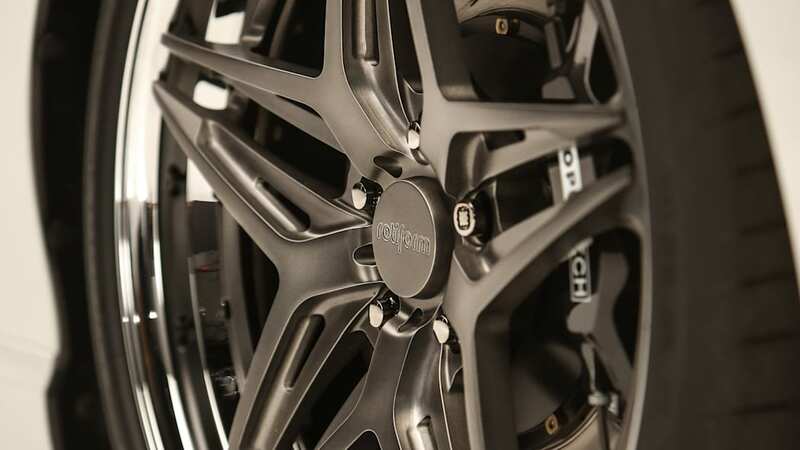 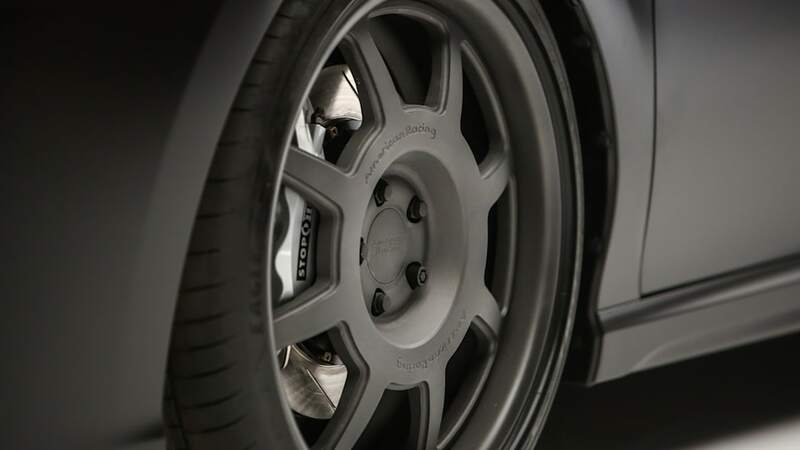 The car features special one-off American Racing wheels that finish the car off nicely. 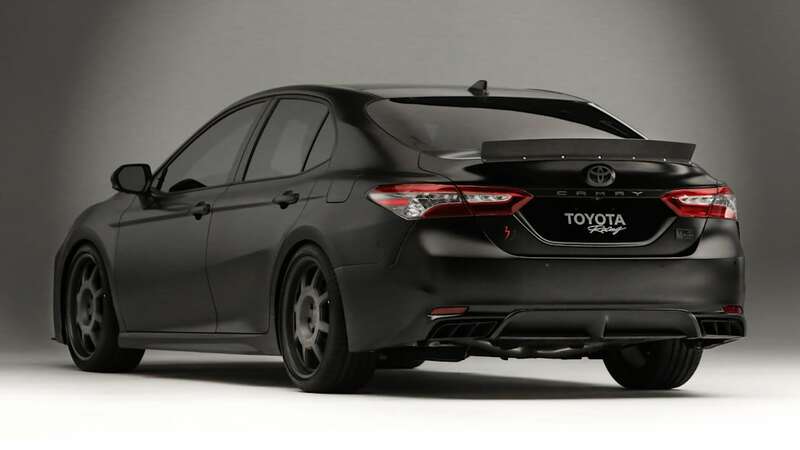 Few body modifications have been made except for another NASCAR-esque spoiler, and exhaust tips with dividers in them. 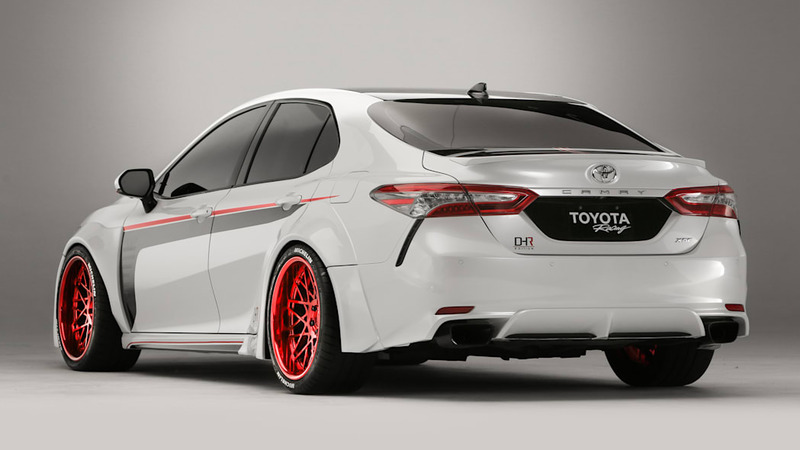 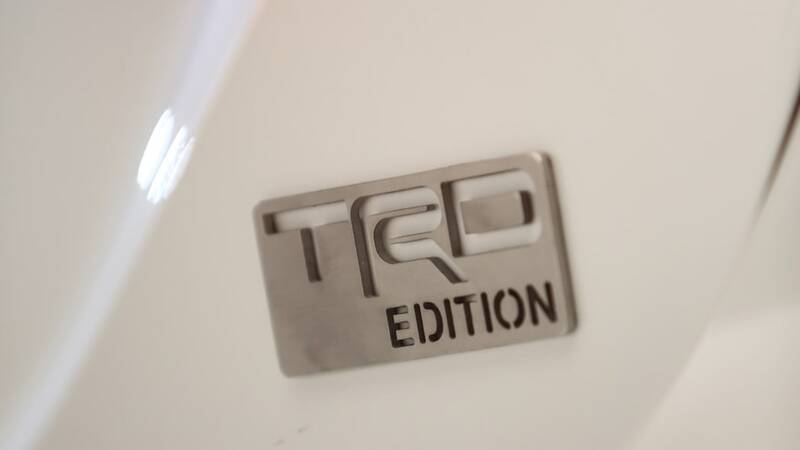 Performance upgrades include an AEM intake, TRD exhaust and Tein coilovers. 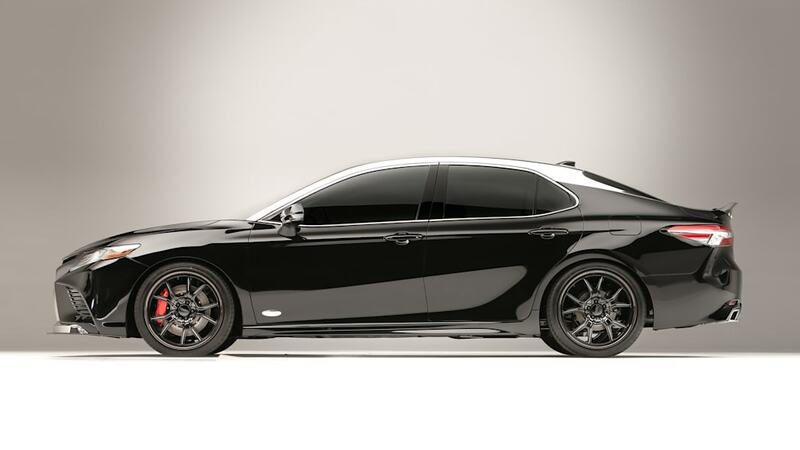 The inside is just as dark as the outside, and is very understated in contrast to the others.